Real Absinthe (sometimes also called Absinth or Absynthe) contains the herb artemisia absinthium, also known as wormwood. The essential oils of the wormwood plant contain the ingredient "thujone / thujon". The amount of thujone in an Absinthe is limited by law. In the US 10 mg per liter are legal, in the European Union up to 35 mg are legal. At our online store we offer a large selection of different styles of real European Absinthe for sale. In this regard these wormwood Absinthes can be considered as strong, but have in mind that Absinthe is NOT a hallucinogenic drug. You will not see pink elephants. 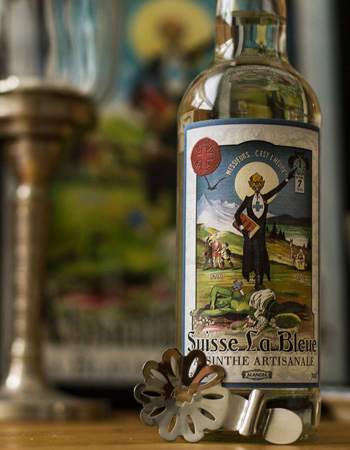 Absinthe should primarily be consumed because of its rich culture, fascinating taste and of course its unique drinking ritual. Absinthe made with a higher amount of wormwood has a stronger Absinthe taste profile. Distilled wormwood is slightly bitter, but has as well a very delicious flowerish, perfumated taste. Therefore you can say, that strong wormwood Absinthe differs tastewise from Absinthe made with less wormwood. What is Absinthe and which one contains wormwood? Absinthe is a liquor distilled out of the three herbs, they are the holy trinity of Absinthe: Grande wormwood, lat. artemisia absinthium, fennel and green anise. Various other herbs can be added, depending on the specific recipe. The notorious spirit has an alcohol percentage of approx. 68% / 138 proof and is naturally green in color. You drink Absinthe with ice cold water and a sugar cube. You don't drink it as a shot! The taste is licorice, due to fennel and anise. The wormwood plant makes Absinthe slightly bitter from its taste. That is also the reason why it is consumed with one or two sugar cubes, depending on your preferences. Wormwood-flavored alcoholics, particularly Absinthe, were the “drink of the age” in France a hundred years ago. Wormwood leaves are silvery green and the plant is growing up to 1.5 meters. The plant contains an essential oil with the ingredient "thujone". Thujone was blamed to cause mental illness, that was the official explanation why Absinthe should and finally was prohibited at the "Fin de Siecle". Thujone does not only appear in the wormwood plant. It is a monoterpenoid ketone also appearing in sage, thuja and, according to some sources, in a close relative of mugwort, southernwood. But Absinthe got legalized once again (1998 in the EU and 2008 in the USA). Why? Because wormwood Absinthe was stigmatized at the turn of the century. It was blamed for social problems in society. It was the scapegoat for an anti-alcohol movement which was big during this time (Prohibition in the USA). But the scientific facts are different, and therefore Absinthe got legalized once again. It was proven that only very high doses of thujone are a threat for your health. Does Absinthe nowadays still contain wormwood? Yes! Nowadays you can buy real Absinthe with wormwood online. Some rumors exist, that Absinthe was stronger back in the days. But this is a myth. Vintage Absinthes were analysed and it was proven that they did not contain higher amounts of wormwood. If you find Absinthes in the net advertising with 100mg thujon or more (King of Spirits Gold for example or Century Absinthe) then this is nothing more than a rip off. These bottles are sold for a very high price, but sometimes don't contain any wormwood at all! Read more about the Absinthe Effect here, if you are interested. Besides its usage in Absinthe you can also brew a tea out of wormwood. Soak one teaspoon of the herbs in a cup of hot (non-boiling) water. The tea has a bitter taste, which hardly can be avoided. You can mix it with peppermint leaves or anise or add sugar, but it still will keep its significant taste. Wormwood is used medically as a tonic, stomachic, febrifuge and anthelmintic. Wormwood is also used to give some other alcoholic beverages its taste. For example the commonly known "Vermouth" (Martini), where dried wormwood used to give the wine ist specific taste. Anyway, Martini contains no thujone. Where can I buy real wormwood Absinthe? You can easily buy a bottle of wormwood Absinthe online at ALANDIA. We ship worldwide including the USA. Shipping is done via Courier Express and takes just 2-3 business days. The delivery is guaranteed, therefore there is absolutely nothing you have to worry about. If your order does not arrive, whatever the reason might be, we will refund you your money. And it doesn't matter if you are looking for bottles of strong Absinthe or accessories like Absinthe spoons, Absinthe fountains, or Absinthe glasses. We offer it all for sale. ALANDIA is the World of Absinthe :-) Green Greetings!